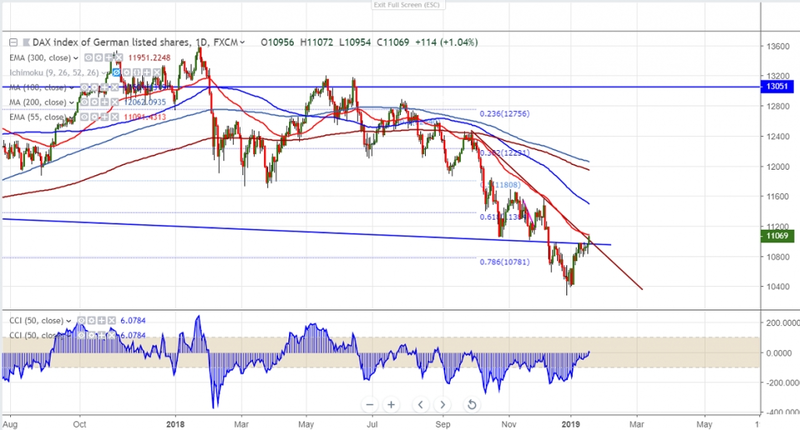 DAX30 has broken major resistance 11000-11040 level after a long consolidation.The index was trading in narrow range for past six trading session between 10977 and 10792. The index was following footsteps of US markets on easing trade war tensions between US and China. The index jumped nearly 7.46% from low of 10281 and is currently trading around 11042. The index is facing strong resistance around 11092 (55- day EMA) and any break above targets 11592/11869. On the lower side, any violation below 10781 (78.6% fib) confirms minor weakness and break below targets 10689/10402. It is good to buy on dips 11000 with SL around 10780 for the TP of 11590/11869.